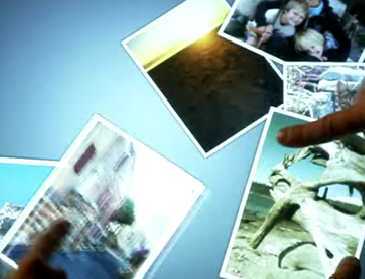 Tonight, Microsoft announced its new "Surface" multi-touch interface and hardware system. Looking for all the world like one of those old Ms. Pac Man video game tables found in older bars and pizza joints, the Surface device combines a high-power Windows computer with a 30" display, set horizontally. Surface is controlled by touching this screen with one or more fingers, manipulating images in a reasonably intuitive manner. The system bears a remarkable resemblance to the multi-touch display Jeff Han demonstrated at TED in 2006, but it's unclear just how much (if anything) he had to do with the Microsoft product. Surface does include some nifty features that Han's vertical-mounted screens couldn't do, such as recognizing when a digital devices has been put onto the table and reacting accordingly -- downloading pictures from cameras, opening up a jukebox app for a MP3 player, etc.. I was impressed by the gestural controls for these features (such as "tossing" a file towards a device to upload it); a key aspect of a usable kinesthetic interface has to be a subtle sense of physics, so that "objects" (virtual though they may be) have a perceived mass and momentum. Okay, nifty tech, undoubtedly terrifically expensive for the foreseeable future, but if it's at all functional -- and my guess is that it will be -- it's probably a progenitor of a device we'll have in our homes by the middle of the next decade, and will find in cereal boxes not too much longer after that. What struck me while watching the demos and reading the breathless write-up in Popular Mechanics (of all places) was that the multi-touch display system is probably the apotheosis of the two-dimensional interface model. It comes the closest to treating virtual objects as having 3D space and weight without compromising the utility of more traditional flat documents and menus. Users aren't limited by a single point of contact with the display (e.g., a mouse pointer), breaking a ironclad law dating from the earliest days of computers. In the end, a mouse pointer and a text insert cursor are making the same claim: here is the sole point of interaction with the machine. Multi-touch interfaces (whether Microsoft's Surface, Apple's iPhone, or whatever) toss aside that fundamental rule. The appeal of Surface (etc.) for computing tasks, however, will be limited in many commonplace arenas. Multi-touch isn't going to make spreadsheets, blogging or surfing the web any simpler or more powerful. It will have some utility in photo and video editing, although here the question of whether greasy fingers will prove a regular problem rears its head. No, the real market for multi-touch is in the world of the Metaverse, especially in the Augmented Reality and Mirror Worlds versions. The core logic of both Mirror Worlds and Augmented Reality is the intertwining of physical reality and virtual space, in large measure to take advantage of an information substrate to spatial relationships. This substrate relies heavily upon abundant sensors, mobile devices and a willingness of citizens to tag/annotate/identify their environments. The Augmented Reality form emphasizes the in situ availability of the information substrate, while the Mirror Worlds form emphasizes the analytic and topsight power. In each case, the result is a flow of information about places, people, objects and context, one which relies on both history and dynamic interconnections. This may well be the breakthrough technology that makes it possible to control information flows. Both of these manifestations of the Metaverse could readily take advantage of an interface system that allowed complex kinetic and gestural controls, with Mirror Worlds working best with a massive table/wall screen, and Augmented Reality working best with a hand-held device -- or maybe just the hand. One of Jeff Han's insights while developing his multi-touch system was that human kinesthetic senses need something to push against to work right. "Tapping" something virtual in mid-air may look cool in the movies, but runs against how our bodies have evolved. Our muscles and minds expect something to be there, offering physical resistance, when we touch something. Rather than digital buttons floating in mid-air (or a total reliance on a so-called "conversational interface"), mobile systems will almost certainly have either a portable tablet or (in my view the eventual winner) a way to use one hand drawing on another to mimic a stylus and tablet. The parallel here is to the touchpad found on most laptops: imagine using similar gestures and motions, but on your other hand instead of on a piece of plastic. There are some obvious downfalls to this interaction model -- from the aforementioned greasy fingers to the ergonomics of head and arm positions in extended use -- but my guess is that the number of innovative applications of the interface (most of which haven't even been imagined) will outweigh any initial physical clumsiness. I've been traveling this long weekend, attending the wedding of our good friends Taylor and Jeremiah. 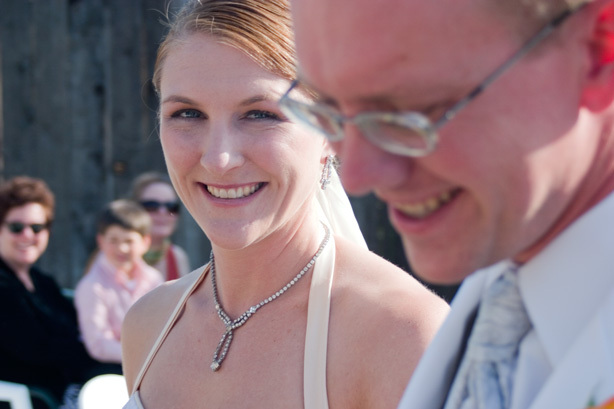 I served as the wedding photographer (I've been doing photography for years, as a nice non-textual hobby). Normally I post about ideas and futures, but it is my blog. I thought Taylor looked so beautiful in this picture, I had to share it. Congratulations, you two! Okay, this is kinda cool. I'm posting this entry via my new Nokia n800 interwebtube tablet (tubelet?). As much as I've long been fascinated by mobile devices, most tend to be better-suited to information consumption than creation. The n800 is the first one I've tried that makes posting to OtF at least a reasonable option. What makes this device particularly appealing is that it uses Linux as its OS, not Windows Mobile. It will be my first everyday Linux box. I'm entering this post via the touch screen keyboard. It's not perfect, but it's far better for text creation than a phone's number pad. I wouldn't want to write a novel this way, but the occasional blog post won't be too bad. When I get a bluetooth keyboard to go with it, I'll be set. What is it missing? A decent camera, for one thing. The little pop-out camera is cute, but very low rez. I'd also like to see it be able to sync with my laptop, pulling over bookmarks and contacts automatically. Nevertheless, I'm looking forward to seeing what I'll be able to do with this. Plowing through interesting links accumulated during my travel.  Lucky to be Alive: All of us are. Lucky to be alive, I mean. 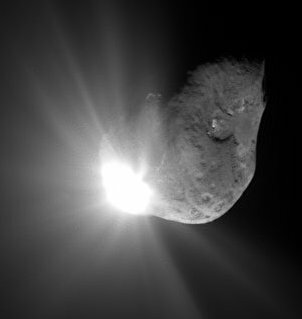 It turns out that, about 13,000 years ago, humankind came very close to extinction, courtesy of a 2km-3km comet smacking into the Earth. This discovery manages to explain several roughly simultaneous but previously hard-to-connect events, including the "Younger Dryas" mini ice age, megafaunal mass extinctions, and the utter elimination of the first wave of Homo sapiens migrants into North America. 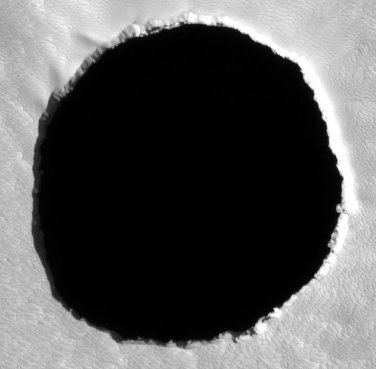 Details of the discovery will be presented this week at the American Geophysical Union meeting in Acapulco. (Session One, Session Two, and Session Three abstracts.) More details at New Scientist. [In reference to Roger Angel's massively multi-mirror sunblock idea:] Ralph Cicerone, a climate scientist and president of the US National Academy of Sciences, singles the paper out for praise for the painstakingly careful way it was done. "He went back to it again and again," Cicerone says. "In its standard of elegance and completeness it was exemplary." For him and many others, such academic excellence is the main point of publishing research on geoengineering. For these researchers, the aim is not to find feasible solutions but to do good science that provides a standard against which to judge the less good, or flatly foolish, schemes that might otherwise accrete around the idea. Cicerone points to quack schemes for ozone replacement in the 1980s as the sort of thing that needs to be forestalled: back then, he says, "poor ideas got as far as they did because of [the community's] silence." Say it with me: if climate disaster hits faster and harder than anticipated, desperate people will try desperate measures, including geoengineering. We need to be able to identify the choices that won't just make things worse.  Artifice 2: Robo-Brothers in Arms: Joel Garreau has a terrific piece in the Washington Post called "Bots on The Ground," discussing the growing use of robots (remote-controlled and semi-autonomous) in the U.S. military. The piece is worth reading for the opening anecdote alone, which underscores just how powerful emotional relationships with machines can be. Without using the term, Garreau makes it clear that these technologies are as much a form of emotional augmentation as they are ability augmentation. The animate devices become extensions of the self, even as they take on at least the superficial appearance of independence. This is new territory for technologists, but in many respects it's a long-standing element of our culture. In the past, though, we just called them "pets." Will we be able to think of robots in the same way? My cat is sleeping on the desk next to my keyboard as I write this. As I look at her, I find myself unsure of whether I'd be able to have the same emotional bond with something artificial. Will this be the real 21st century generational dividing line?  Join an Institute for the Future Project: The following was sent to me by my colleagues at the Institute for the Future, and they agreed to let me repost. The Institute for the Future (IFTF) is an independent nonprofit research group. We work with organizations of all kinds to help them make better, more informed decisions about the future. We provide the foresight to create insights that lead to action. We bring a combination of tools, methodologies, and a deep understanding of emerging trends and discontinuities to our work with companies, foundations, and government agencies. We are currently recruiting for a new research study called "Boomers in the Next 20 Years". For the purposes of this study, people who were born between 1946 and 1964 qualify as Boomers, and you do not need to identify as a Baby Boomer to participate. The study is about how you will respond to the changes and challenges in the next 20 years. We want to know about your experiences and the decisions you are making and foresee making in the areas of health, finance, work, family and community. Participation would include a response to this survey, followed by a brief telephone interview and a 2 hour interview in your home to be scheduled between June and August, 2007. Not all people who complete this survey will be selected for further interviews. Participants who complete of all phases of the project will be given a stipend of $100, paid by American Express gift card. Take our brief Recruitment Survey to get involved, or forward this message on to people you know who may be interested in participating. Thank you for your time! If you have any questions about participating in the project, please direct them to mlueck@iftf.org. Security specialist Bruce Schneier uses a particular term to refer to the practices that are highly visible but ultimately of little value: "security theater." One of the canonical examples of security theater is the requirement that one remove one's shoes at the airport, or more recently, the 3 ounce limitation on liquids carried on-board a plane. These are demands that have little practical effect, but -- in large measure by inconveniencing travelers -- they give the appearance of doing something about aircraft security. Today, just about fifteen minutes ago, I saw the normal level of security theater taken to new heights. In the past, my flights to London have been on British Airways; this time, for a variety of reasons, I gave Virgin Atlantic a try. 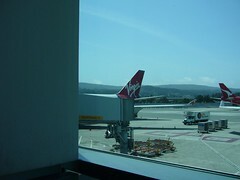 The SFO to LHR leg was generally pleasant, at least as pleasant as trans-Atlantic flights can be (i.e., I was constantly feeling guilty about the carbon footprint of my flight). The security theater in San Francisco was perfunctory and reasonably efficient.  Allow the screener to poke through my carry-on bag. Given what later transpired with the laptop, I was surprised that he didn't seem particularly interested in my unusual-appearing camera or multiple mobile phones (the woman being grilled next to me spent much of her time struggling to remove the battery from her lone mobile).  Open and drink from the bottle of soda I had purchased from the vendor around the corner from the gate (and well-within the departure area).  Remove my shoes again, so that the screener could... well, all he did was lift each boot. I'm not sure what that told him, other than I have reasonably lightweight boots.  Open up my laptop screen so that he could run his fingers across the keyboard. He didn't care whether the laptop was on or off, or whether it worked -- just that the keys moved.  He then told me to remove the battery. I told him no, that I needed to shut the machine down first so that I didn't lose data. I felt perversely amused that the laptop seemed to take three times longer than usual to shut down. Once the laptop had finally shut down, and I had removed the battery, all he did was look into the battery slot for about a second, if even that long. "All clear." When I said that this all seemed rather absurd, given that I'd just gone through a screening a short while before, he sniffed that this was being done because I was flying to the United States, and that required extra precautions. I asked if British Airways was doing this, too, and he said that he hoped so -- but when I said that they weren't when I flew just a few weeks earlier, he just shrugged. This wasn't done to me as a special random (or lone-male) screening. Every passenger on the 747 received this treatment. Given the screener's replies, I have no reason to believe that this was a just-added layer of security in response to a new threat. Okay, I understand that, on the grand scale of things, this is at worst an inconvenience. But in many ways, it's the perfect illustration of just how brain-dead the current security model has become. This is all about going through ritualized motions without any actual utility. It's cargo-cult security. And that makes it dangerous. To the extent that flyers -- citizens -- believe that this kind of time-consuming and vaguely humiliating inspection (the crotch-grabbing pat-down really should have a safeword) actually makes the flight safer, they're less-likely to pay attention to their surroundings. Someone who decides to do something evil on the flight has a greater chance of being successful, simply because passengers are made to think that the security theater actually made a difference. The combined self-interest, awareness and reason of the public is our greatest source of defense against the unthinkable. This is true whether we're talking about human-caused or natural disasters. Anything that mutes these defenses without offering compensating benefits works to our ultimate detriment. The second podcast emerging from the conversation session with RU Sirius last week is now available. 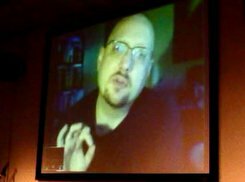 RU Sirius Show #109 (Weekend Edition): Why Big War is Becoming Obsolete: Jamais Cascio of WorldChanging fame leads us in a discussion about being good ancestors and why networked global guerrillas are rendering Big War obsolete. This is, of course, based on the "Lost Hegemon Part 2" piece from May 7. And today, I'm once again chalking up the carbon debt, heading back to London for the next part of the Open University engagement. I normally fly British Airways, but I've been annoyed enough at their service (especially with regards to using accumulated FF miles for upgrades) that I decided to try Virgin. Gotta make sure that Sir Richard has the $25 million he needs for his geoengineering challenge, you know. Unless absolutely necessary, I don't fly United -- not since the engine caught fire on a flight to Philadelphia, while still on the tarmac, and because we were already late the crew didn't respond until quite literally the whole passenger cabin was yelling. Fool me once, shame on, shame on you, fool me -- can't get fooled again. Or something like that. RU Sirius Show #108: Justin from Justin.tv Brings It Justin Kan has shared his view of the world with all of us… literally, since March 19, when he hooked a mobile camera to his hat and started streaming live video 24-7 (more or less) on his justin.tv site. He joined us live in our studio for this program. And check out “Stereotypes” by Bos105, Justin’s brother! Justin of Justin.tv was the guest at today's recording of the RU Sirius podcast. A pretty genial guy, he seems reasonably conscious of the implications of his ongoing project. For those of you unfamiliar with Justin.tv, he wears a live-streaming wireless camera on his hat all day, every day, recording everything he sees. These recordings are available as archives. You can see the archive of today's RU Sirius interview here -- scan ahead to 2:45 to see his arrival. The conversation is lively, and worth listening to. As pictured, I have the honor of being the very first person ever to try to spam the justin.tv video feed -- unsuccessfully, as the resolution on his camera is pretty lousy. 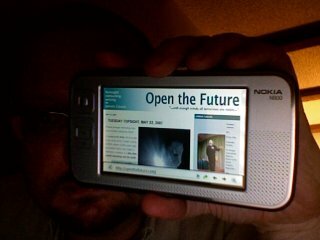 Fortunately, he was nice enough to read out what I wrote: the URL for Open the Future. I'm sure the money will start rolling in any second now. The U.S. is Microsoft. Al Qaeda is Linux. 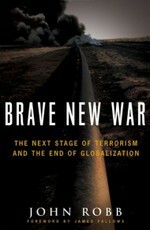 That, at least, is the grossly-oversimplified version of John Robb's new book, Brave New War. Such a parallel has nothing to do with politics, but with position. The United States, and other centralized, conventionally powerful global actors, fill a role in the geopolitical ecosystem akin to Microsoft: big and slow to respond; wealthy and wasteful; hierarchical and ossified. Al Qaeda, and other distributed, guerrilla insurgency and terrorist movements, fill a geopolitical role more akin to Linux: decentralized and nimble; open to new entrants; innovative out of necessity. It's for good reason that Robb refers to the conflicts now underway as "open source warfare," and the distributed participants, "global guerrillas." I'll leave it to others to address the military implications of Robb's argument; it's enough to say that I found his ideas compelling (this should come as no surprise, given how often I link to his site when I write about global politics). I'd like to focus, instead, on what he calls out as the proper response those opposed to the global guerrillas should adopt. Robb makes it clear that the tactics the United States (and, to a lesser extent, Europe and other post-industrial nations) now employs are bad, bad ideas. "Knee-jerk police states" and "preemptive war" fall into a category Robb borrows from security specialist Bruce Schneier: "brittle security." The big problem with brittle security is that, when it fails, it fails catastrophically; moreover, by employing these tactics, the U.S. (etc.) undermines the very moral suasion and memetic influence that are among the most important tools to fight empowered extremism. He proposes instead the adoption of "dynamic decentralized resilience:"
It is simply the ability to dynamically mitigate and dampen system shocks. Specifically, it is those things we (and our state) can do to change the configuration of our networks to ensure that intentional or naturally occurring attacks on our society don't do much damage or spiral out of control. "Resiliency," conversely, admits that change is inevitable and in many cases out of our hands, so the environment -- and our relationship with it -- needs to be able to withstand unexpected shocks. Greed, accident or malice may have harmful results, but [...] such results can be absorbed without threat to the overall health of the planet's ecosystem. If we talk about "environmental resiliency," then, we mean a goal of supporting the planet's ability to withstand and regenerate in the event of local or even widespread disruption. This isn't simply a coincidental use of the same word. The overlaps between social resilience and ecological resilience are quite profound. A small example of this can be seen when Robb leads us through reconfiguring an existing system to make it more resilient. He argues that the power grid could be made much more resilient -- that is, much better able to absorb and mitigate threats -- by becoming much more decentralized, with individual buildings becoming power generators as well as power consumers. To be clear, this isn't a call for energy isolationism -- he doesn't want to go "off-grid." It's a call for a much more deeply-networked grid. And it happens to be an argument very familiar to those of us looking at ways to deal with environmental crises, not simply because it supports greater use of renewable energy, but because of its resiliency under stress. Looking more broadly, Robb lists three rules for successful "platforms," or sets of services, operating under his resiliency model: transparency (so all participants can see and understand what's happening); two-way (so all participants can act as both providers and consumers of the services); and openness (so the number and kind of participants isn't artificially limited). Again, these rules should sound very familiar to readers of (among other sites) Open the Future and WorldChanging. Natural disasters, such as tsunamis, earthquakes, and pandemic disease. Environmental collapse, especially (but not solely) global warming. Emerging transformative technologies, such as molecular manufacturing, cheap biotechnology and artificial general intelligence. Even (should it happen) the Singularity. John Robb addresses some of these when referring to "naturally occurring attacks" or the value of sustainability as a way of supporting resilience. Because he focuses on the military/security manifestations, however, he doesn't make a strong connection to the broader utility of the concept. I hope that he starts to look more closely at these other arenas as sources of innovation and even alliance. The one element that Brave New War lacked, and would have been well-received, is some exploration of what kinds of counter-global guerrilla strategies might be in the offing. He's clear that the current approach is disastrous, and the resilience argument does a good job of showing how post-industrial nations can better survive the threat of global guerrillas without surrendering their values. But I found myself wondering what kinds of tactics and technologies will emerge as a way of meeting the open source warfare threat head-on. Is it something as obvious as re-tooling conventional militaries to adopt more "open source" style techniques? Is it something as surprising as a shift in focus towards what might be thought of as an "open source peace corps"? Maybe it will require a major technological leap, where we find that the best counter to open source guerrillas is ultra-high-tech swarming bots, or nano-weapons, or something even more startling. The question I have for John Robb is, then, if we build the open future, how do we defend it? PASADENA – The job posting was a head-scratcher: “We seek a newspaper journalist based in India to report on the city government and political scene of Pasadena, California, USA.” [...] Outsourcing first claimed manufacturing jobs, then hit services such as technical support, airline reservations and tax preparation. Now comes the next frontier: local journalism. The editor who ran the ad argues that, since the Pasadena city council now puts its meetings online, reporters covering the city can be anywhere. And while this particular example may not hold true this time around -- city governance is more than city council meetings -- it's clearly going to be possible at some point soon. Of course, the editor's job isn't going to be so stable, either. Whether because of automated selection software ("botsourcing," as with Google News) or social filtering software ("crowdsourcing," as with Digg), specialized editor skills are of declining value. And there's really no reason why editorial duties couldn't be outsourced, too. Add in remote collaboration and presentations, and the same will hold true for lawyers, accountants, even (gulp) consultants. The combination of increasingly smart software, social network-based activities, and highly-educated low-cost workers around the world looks likely to hit knowledge workers as hard -- if not harder -- than previous waves of automation and outsourcing have hit ostensibly less-skilled jobs. Botsourcing/crowdsourcing/outsourcing knowledge work may turn out to be a very attractive option, given that these tend to be higher-paying jobs. Ironically, it's entirely possible that the carbon footprint of shipping may add so much cost to outsourced manufacturing that those jobs get re-localized, whereas the knowledge jobs (needing only an Internet connection) end up being globalized. So are we headed to a world where the only stable jobs are those that absolutely require hands-on contact -- health maintenance, grooming, and the like? Or to one where wages even out across the world of skilled workers? Neither strikes me as terribly appealing or stable. In the past, economic transitions that resulted in lost jobs inevitably led to arguments that such losses were transient, as new technologies and industries would be opening up, and new skills would lead to new jobs. But that argument rests on the assumption that there were categories of work that couldn't easily be de-coupled from the workers, because of highly-specialized skills. In a world where the only job characteristic that can't readily be de-coupled is proximity, is it even possible to come up with new jobs that can't immediately be shipped out or chipped out? This, coupled with the likely rise of molecular manufacturing over the next 20 to 25 years, strikes me as a key early indicator that we're shifting into an entirely new kind of economy. Given that the folks at the Takeaway Festival weren't recording the talks for posterity, I didn't expect to see how the Skype-video presentation I did on Wednesday turned out. It turns out, though, that British designer Cubicgarden brought his trusty videocamera to the event, and one of the talks he recorded was mine! The sound quality isn't all that great -- certainly more my fault than anyone else's -- and it's pretty clear that I'm coming in over a web cam... but it's another interesting example of using web tech to carry out work that previously would have demanded travel. Thanks for taping the talk, Cubicgarden! Yesterday, I was an invited guest at a World Economic Forum meeting on global risks. The WEF personnel tasked the attendees with helping to figure out key focal points for next year's Forum in Davos. I can't say much more until the official report is out (soon, apparently), but to give you a sense of what the group works on, here's a link to the Global Risks 2007 document(pdf) published in February. Main conclusion I reached: the corporations represented in this meeting were all very cognizant of the risks coming from global climate change, and none of them tried to push back on the science at all. At the same time, they remained focused on the near-term implications, and seemed blind-sided by some of the suggestions of likely future results I offered. Nothing I said would have come as a surprise to regular readers of the leading green blogs, but there were some worried looks when I was done (all related to the policy implications, not the geo-science). 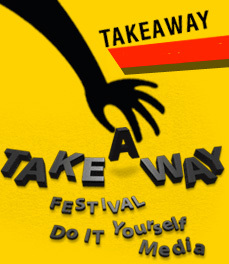 Today, I spoke to the Takeaway Festival in London. I did so via Skype video, from the comfort of my home office. The positives: did not have to fly to London for a 20 minute presentation, a win-win-win for me (no 10 hour flight to deal with), for the festival (no international plane fare to pay for), and the Earth (far less carbon output from the videoconference than from a flight). I could sit comfortably (arthritis flare-up again today). Got a chance to try something new. The negatives: no way to get realtime feedback from the audience, whether in terms of confused looks, laughter or applause. Couldn't talk with my hands (i.e., gesticulate for emphasis or balance while I talk), because I was too close to the camera -- but if I pulled back enough to see my entire upper body, the graininess of the Skype video connection would have left my face indecipherable. Couldn't see the space, since the London camera was on a laptop stuck in the back of the room, blocked by a crowd of people standing. I don't think I'd want to do video presentations on a regular basis, but I'm glad I got a chance to do this one. Finally, RU Sirius has asked me to serve as co-host for this weekend's Neofiles podcast. The guest will be Justin, of Justin.tv. Should be fun -- and I'll link to the audio file when it's up. ...and I'd better not catch any of you using it! Busy week coming up: working a panel on the future of sustainability tomorrow; delivering a talk to the TAKEAWAY festival of DIY media, in London (I'll be presenting remotely); lots of IFTF stuff; and prepping for a return to London for the next leg of the Open University project.  Green Panopticon Begins: UC San Diego's Shannon Spanhake has come up with a small pollution monitor built to send data to cell phones. She calls it Squirrel. Squirrel fits in the palm of your hand and can be clasped to a belt or purse. The small, battery-powered mobile device can sample pollutants with its on-chip sensor. The current prototype measures carbon monoxide and ozone, but eventually the device will be able to sample nitrogen oxide and sulphur dioxide in the air, as well as temperature, barometric pressure and humidity. It’s what happens next that makes Squirrel a powerful tool in the fight against pollution. Using a Bluetooth wireless transmitter, the device connects to the user’s cell phone. A software program called Acorn allows the user to see the current pollution alerts through a screensaver on the cell phone’s display. The phone also periodically transmits the environmental data to a public database on the Internet operated by the California Institute for Telecommunications and Information Technology (Calit2), which is funding Squirrel’s development. Hmmm. Any of this sound familiar?  Micro-Dam It! : Gregg Zachary writes in the May 2007 edition of IEEE Spectrum about the growth of micro-hydro in Africa as a way around the ongoing energy production crisis across most of the continent. Small dams, which can produce anywhere from a few kilowatts to a few megawatts of power, have proven to be more reliable, more environmentally sound, and more flexible than traditional hydroelectric megaprojects. The microhydro dams, which produce no more than 100 kilowatts, have become especially popular, as they can be built and maintained with minimal demands on government or outside support. It's a reminder that the electricity issue in Africa, as elsewhere, is as much political as it is technical. Big dams are prestige projects, symbols of national power that drive employment and industry. Small hydros, dispersed and difficult for the government to keep track of, let alone manage, seem vaguely subversive. That reminded me of something I dug up back in the late 1980s, doing research on Pakistan's development of atomic weaponry. The driver for most Pakistanis wasn't military might or even deterrence against India, but prestige: building an atomic bomb would demonstrate to the world that Pakistan was as advanced, as capable, as any other top-ranking nation. The connection between mega-projects and national pride -- especially in areas historically the target of other nations' whims -- should not be ignored by those of us seeking to change behavior.  You Don't Live Longer, It Just Feels Like It: Calorie restriction, aka cr, is a long-recognized path to longevity. Cutting the diets of mice by 40% gives them 50% longer lives than mice fed a normal, healthy diet. I'm sure we're all ready to jump on that bandwagon. So biogerontologists are looking for so-called "cr-mimetic" drugs, just as resveratrol, that trick the body into behaving as if it is receiving a limited diet. That search just took a big step, with the discovery of a particular gene, pha-4, that is tied directly (and, apparently, exclusively) to the calorie-longevity tradeoff. The usual disclaimers apply: still early research; may not work in humans as it does in other animals; the influence of genes isn't as well-understood as popularly believed; don't expect your insurance to pay for it.  Maybe for Cell Phones Next? : New Scientist reports on the development of a $10 DNA-replicating device, a cheap, pocket-sized PCR (polymerase chain reaction) system. PCR is pretty much a cornerstone process of nearly all genetic testing and engineering. The device has no moving parts and costs just $10 to make. It runs polymerase chain reactions (PCRs), to generate billions of identical copies of a DNA strand, in as little as 20 minutes. This is much faster than the machines currently in use, which take several hours. It still needs a way to isolate DNA samples for replication, so don't expect it to show up at Target any time soon. Still, once it's ready, the medical applications, especially in the developing world, will be outstanding. Perhaps of even greater impact, though, will be the uses developed by open-source hardware hackers, looking for ways to make the system do what the designers never anticipated.  The Roof, The Roof, The Roof is Oddly Bright: And finally, Summer has arrived. Less than a week ago, it was windy and rainy here; today, it's set to be in the low-to-mid-90s. Good thing we had to replace our roof. One of the first pieces I ever wrote for WorldChanging that got a bit of attention was Green and White, talking about some research done by the Lawrence Berkeley Labs indicating that light-colored (or, best of all, white) roofs made such a dramatic difference in warmer climes that replacing a roof with white shingles would save more power (from cooling) than would be generated by replacing that roof with solar panels. When it came time to replace the roof of our house, you'd better believe we went white. Or Ash Grey, which was a newer generation shingle with a slightly better efficiency rating than the white shingles. 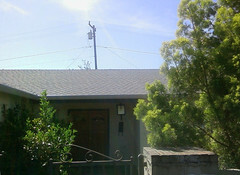 The additional cost over the basic cheap shingles (which only come in faux-wood dark colors) will be easily matched by the greatly reduced air conditioning bills and the one-time rebate from PG&E, the local power company. Best of all, no more sweltering at midnight. Behavior changes matter. System changes matter. But let's not forget the value of offering people a chance to do the right thing when they need to meet existing needs.